First of all, I purchased a 9X12 artist's sketchbook with approx. 95 pages. Then I decided how I was going to divide the periods of history (more on that below) and I chose a different colored marker to coincide with each period. 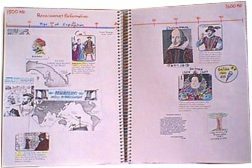 In my book, I put a 3/4 size page between the regular pages from the Year 1 AD on. The reason for the 3/4 size page is so that you can still see the numbers of the timeline above the page. It gives you extra space for that period if you need it. It is especially nice to have this extra space if you are going to add to the timeline over many years as you pass several times through the same period of history. To make this 3/4 page I just marked the cutting line with a pencil then used my rotary cutter to cut the top 1/4 of the page off. 10...(2 pg spreads).....Classical World 500 BC to 500 AD (100 years per 2 pg. spread) * from 1 AD on I added the extra page in the middle. You'll have to add that into your count if you want to do it that way. On the pages where I added in a second color line to designate another period...I wrote the name of that period near the line in it's appropriate color. 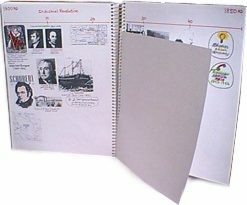 Another possibility would be to use a 3 ring binder and loose pages. That way you could add them in as need be and you would not need the 3/4 pages. You could purchase drawing paper (which is heavier than copier paper) and then cut it to size and hole punch it. This would give you a nice weight paper to work with. 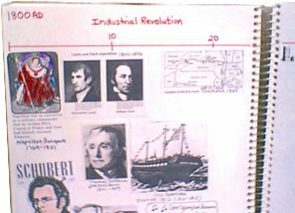 For timeline figures I used pictures I cut out or copied from and old Funk and Wagnall's encyclopedia, made photo copies from books, or I drew them myself. Some are also from a purchased timeline figure set from J & K Schooling. There timeline figures are meant to be put on the wall so they are a little large for a timeline book. However, the author does give permission to photocopy and reduce them in size.